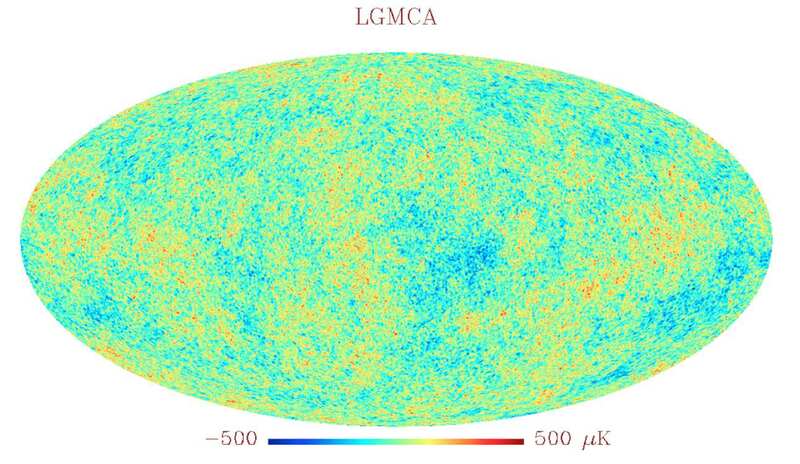 Using the latest data from the Planck and WMAP satellites, the laboratory CosmoStat (LCS) of CEA-IRFU just provides the most complete and accurate picture of the diffuse microwave background of the universe considered to be the primary light emitted at the beginning of the expansion. The new map of the diffuse background was built thanks to a new method of separating components called LGMCA particularly well suited to the separation of galactic foregrounds that blur the background image. Unlike previous results, the map restores the details of the diffuse background across the entire sky including the Galactic plane region of the sky where the estimate is particularly difficult. It is also more effective in reducing the defects introduced by the existence of hot gas in galaxy clusters. These results are in press in Astronomy & Astrophysics and were presented at the conference "Horizon of Statistics" on January 21, 2014 at the Institut Henri Poincare (Paris). The cosmic microwave background or CMB (Cosmic Microwave Background) is a very low temperature radiation (2.7 K or -270 ° C) that fills the entire sky and is detectable in the field of millimeter waves or microwaves located between infrared and radio waves. It is interpreted as a "fossil" light emitted about 370,000 years after the beginning of the expansion when the universe became transparent and neutral. At this time called "recombination", the capture of electrons by atomic nuclei has left the field open to the light which thus became decoupled from matter. This fossil radiation has travelled through the whole universe since the recombination and therefore carries information on the early universe as well as the matter and energy content of the universe and the history of expansion since this time. Its analysis with very high precision is critical for the determination of cosmological parameters. In March 2013, the ESA Planck satellite has provided the most accurate measurements of the background radiation, following the data previously collected by the WMAP satellite of NASA. The map of the background radiation (CMB) provided by the scientists of the CosmoStat laboratory was obtained from the joint processing of Planck and WMAP data. Constructing an accurate map requires prior subtraction of all parasites foreground emission, coming largely from our own galaxy. 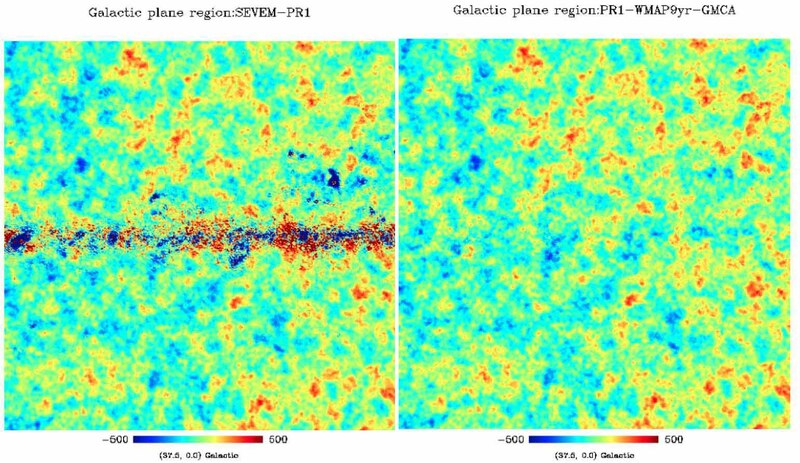 Map of background radiation (CMB) in the direction of the center of our galaxy, reconstructed from the previously published algorithm SEVEM (left) and the new LGMCA method (right). The parasite contribution of the galactic plane is clearly visible on the map SEVEM and totally suppressed by LGMCA method. Credits SAp / CEA. To do this, the researchers used a statistical method of separation of original components, called LGMCA (for "local-generalized morphological component analysis") . This method, based on the parsimonious modeling of data, is particularly well suited to the separation of galactic foregrounds. It has brought significant improvements to the map of the fossil light of the Universe. First, it allows to reconstruct the entire map including the plane of our galaxy, where others methods used so far were forced to rebuild artificially these areas by using "inpainting" methods analogous to photographic digital retouching. It has also been shown that the new CMB map does not contain any detectable residues of the contamination by galaxy clusters called the "SZ-Sunyaev- Zel'dovich effect" . These improvements may seem small to non-speclalist eyes, but they are very important because the quality of the CMB map is of paramount importance for determining the overall characteristics of the Universe such as for instance its matter and dark energy content. In keeping with the philosophy of reproducible research, i.e. the ability for other researchers to reproduce the results, the laboratory CosmoStat also makes totally public the computer codes used for the estimate of the CMB map and its reconstruction . 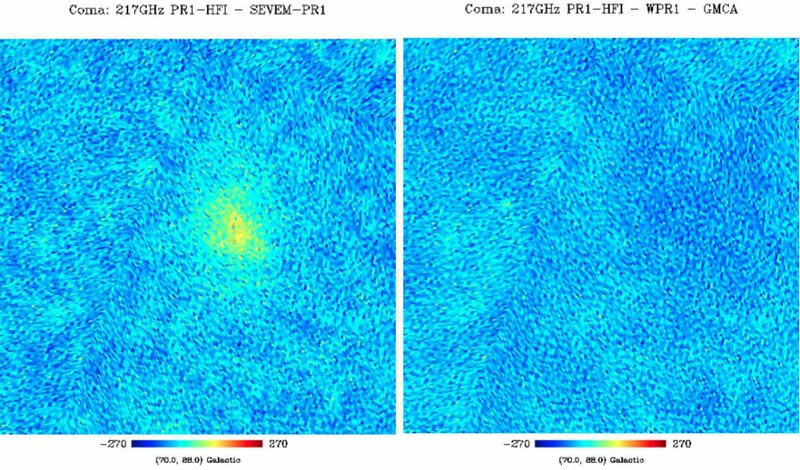 "The European satellite Planck has completed its first All-Sky Survey" (24 March 2010)"
 SZ effect : When the light of the background radiation passes through a galaxy cluster, it collides with electrons of the hot gas borrowing part of their energy. This is the SZ effect, for "Sunyaev-Zel'dovich," by the names of the two authors who predicted this effect for the first time in the late 1960s. In the CMB background, this effect shows up as a "hole" in the background map at a certain energy together whith a bright spot at a somewhat higher energy because the light gain of energy. Searching for this particular SZ signature in the Planck maps, is one of the best way to detect clusters of galaxies even when they are normally "invisible" because they emit too little light. But this effect has to be removed very accurately to evaluate precisely the cosmic microwave background.